Are you interested in shooting video with your DSLR, but not sure where to start? This course will get you up to speed quickly. Get instant access to this course now. This is a beginner level course, and it is prerequisite for more advanced courses to come. This course covers the camera in great detail (everything video related in the manual and more), but it does not cover items sold separately from the camera, editing, rendering and photography features. The manual for the T4i/650D has 372 pages, but unfortunately Canon's manuals are biased towards photography and leave a lot to be desired when it comes to video. This training course fills in those gaps. The true value of this course is saving you weeks or months of time testing your camera to get the best results. Who is the course for? People that have never owned a Canon DSLR before, or people that have had their camera for a while but never shot video. Or, this course is great for people who have not tested all the different settings. You will be able to see how those settings affect your videos. 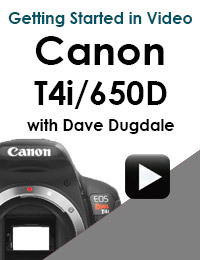 What if you own a Canon 7D, T2i/550D, T3i/600D or 60D will this course apply to your camera? It does apply, however I would hold off on buying this course if you can wait for when I come out with those courses. The T4i/650D has features like a touch screen which I use a lot in this course and different focusing modes that might confuse beginners. "Just finished your video course on T4i/650D. Gotta say it made a lot of difference. I feel really comfortable with the camera considering that I only have had it for a week." "By the way, I got your T4i class for my dad last year, and haven't answered a camera question since! Easily worth 4x the price :-P" - Mark. "Using the British Pound, I wasn’t entirely sure just how much your programme cost me when I bought it (learning dslr video for 650d). Anyway - after processing my end of year accounts the other day I realised it was by far one of the most cost effective online products I bought throughout the year! Above in the Table of Contents you will see at least one free video in the course so you can try it out before you buy. If for some reason you decide you're unhappy with my course you will receive and get a full refund. No waiting for DVD's to arrive in the mail, start watching instantly with streaming videos or if you like you can download them for viewing on a laptop or mobile device outside the area of an internet connection. I have set render these video files to be the highest quality while allowing for fast downloads and streaming. How to set up your camera for video. Basically everything in the manual that relates to video plus more info that the manual neglects to mention. The Canon manuals can be very cookie cutter and are biased towards photography and do not cover video as well as they do with photography, in this course I will fill that void. Photography information such as exposure compensation, the flash unit, RAW image files, etc.. This course does not cover how to edit, render/export your files, this is mostly a prerequisite course for more advanced courses to come. This is for people that have never owned a DSLR before or are interested in shooting video. I will not cover items sold separately from the camera. For example, while I will cover all the ways you can focus in movie mode, I am not going to cover items sold separately like a follow focus and how to use them for video. Shooting video snapshots feature on the T4i/650D. Also specs in the back of the manual.